Förr i världen skickade man pressreleaser. Hoppsan, det gör visst många fortfarande. Låt oss koll ett superaktuellt exempel på hur det går till i sociala medier. Tänkte, jag kollar vad som händer och gjorde en mikrobloggsök på ”Prezi” hos Twingly. Konstaterade snabbt att folk knappast hunnit läsa klart mejlet innan dom twittrade. Räknade snabbt till 50 inlägg i flödet innan jag konstaterade att ordet var redan ute. Så nu är frågan, är det någon idé att jag väntar tills på måndag? Även om jag inte har delat med mig av allt dom bad om (ännu :-), så verkar tillräckligt många andra redan ha gjort det. 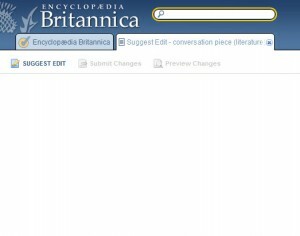 ”Encyclopaedia Britannica Online has just introduced a new program that makes it possible for you as a reader and subscriber to contribute edits, revisions, and suggestions to the encyclopedia”. Sounds cool, so I decided to give it a try. Surfed as they suggest to britannica.com and chose ”conversation” as an entry in need of an update. First impression – this is not an encyclopedia, it’s an advermedia. The only thing I saw was ads, ads, and ads. Then I spotted some entries, clicked one and found the promised ”Suggest edit” button. When I clicked it some kind of edit screen appeared, but it did not seem to work. So I gave up. Sorry, got more important things to do. In sum, they sent me an e-mail and I gave them my attention for a few minutes. The only thing I learned is that I won’t return. Too many ads, and I can only edit what they think is important. And ”conversation” as something we do is nothing I can do anything about – at britannica.com. It is Falkevik, Bambuser, and Webbdagarna who makes good video publishing! Today I made a short visit (to mingle :-) at Internetworld’s two day conference Webbdagarna 2009 in Stockholm. And the event was/is of course live video recorded and streamed – thanks to Björn Falkevik. In the Swedish social media bubble Björn is widely known as ”Mr Bambuser”, because of his frequent use of Bambuser at all kinds of occasions. And the result is, especially compared to my rant yesterday, really good! Of course the video stream was live. Beyond that, the recordings were immediately available in Internetworlds section in the Bambuser site after each break in the programme. Björn used two cameras and a feed from the presenter’s computers so that he could insert their stuff in the stream whenever useful. True, the video quality (resolution and smoothness) could be better. But that is less important if you take budget and value into consideration. In any case, Björn was recording everything locally in full HD resolution. 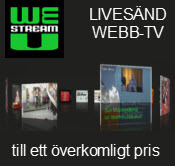 If you want to, you may subscribe to the RSS-feed with videos from Webbdagarna. And of course you can share, embed, and comment the videos. Before I did a key note at Webbdagarna 2007, I spent a couple of hours (my initiative and sole responsibility) to mock up wiki around that event. Afterwards I shared my experiences from that experiment, but most of the back channel support crashed when the wiki provider recently upgraded their platform. This year a much nicer and richer service was set up by Incentive. It integrates wiki, forums, help, instructions, conference programme, blogs, and more – including of course the live video. That is what a small group of clever people, together with Web 2.0 services and the social media crowd, creates. Fantastic! Is it Episerver, Qbrick or WIP that makes a lousy video publishing? Perhaps this rant is just because of my disappointment in neither landing a gig for this year’s Episerver Days nor getting a good response on my pitch to help them with the event’s social media activites. But I would rather like to see it as an opportunity to learn. Again from others mistake, at least in my view. Compare my video conciderations 18 months ago and reflections on how Media & Message 2008 was video documented. An hour ago I got an e-mail from Episerver that announced the release of videos and other presentations material from Episerver Day 2009. Sorry folks, I can’t embed anything here. 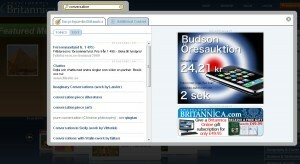 Because the player they use (from Qbrick) does not support embedding. Why is that still so in 2009? During the event the producers published a live video stream by concentrating on the speakers bodies and forgot their slides. A problem that was pointed out in Twitter by the remote viewer @janjarfalk. In post production (which takes time and money) they either inserted the slides over the video or synced them in a separate window beside the video. The latter is perhaps good for people who still spend their days in front of a web page. Sorry, but none of my mobile phones/players supports that kind of solution. It looks kind of fun when Beata Wickbom uses her body and language in her Trendspot presentation to explain and overcome the fact that many of her slides did not show up on the screen . ”Fun”, because on the web page the slides are actually there! In other words, the video and the images tells different stories. Too bad, because Beata and the other speakers did a very good job on stage. I am also curious about what those of you who did not see Micael Herkommer live think. Does his fantastic presentation style come through in the video version of his talk The Pragmatic Web? It is OK to make mistakes. I actually love when people and organizations dare to try new grounds. But Episerver and Qbrick? Two major players in the web field – and this is what they present. WIP, Work In Progress, might be the explanation. If so, please consider my thoughts when fixing things up. As I previously said: the content at Episerver Days 2009 was good. p.s. Even though Episerver did not announce/propose an official hashtag we created #epiday09, which for example can be monitored via Twingly micro blog search. d.s.